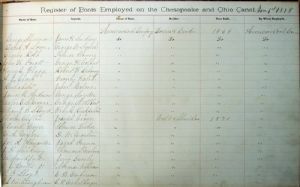 This ledger contains the boats registered in January, 1878. The list of captains and owners includes women and African Americans. William Bauman who transcribed the list noted that by the time the boating season got underway, the boat captain listed in the Boat Register created Jan 1, 1878, was not necessarily the boat captain listed later in The Alleganian,the Cumberland newspaper. The PDF contains the Name of boat, Captain, Owner, Builder, Year built, and By Whom Employed. William Bauman explained that an "outside boat" was one that was not contracted to carry coal for a specific company. They would carry coal wherever they could find a load, and so they were "outside the system". The following document was transcribed from the original, located at the National Archives, College Park, Md. in National Park Service (NPS) files, Record Group 79. All the original material was handwritten in a flowing script font of the day. That means it was occasionally hard to decipher. Readers who have alternate spellings are requested to contact William Bauman who transcribed the documents at wdbauman@visuallink.com and he will endeavor to verify/correct this file. The use of (parenthesis) indicates something the originator added to the file for the same reasons, e. g. (Col,ed) was found in the original manuscript to indicate the person was colored. Users who search the newspaper transcriptions of the day, e.g. Canal Trade 1878, will find some variations in spelling. This Register clearly spelled Abraham Kroone, whereas that newspaper consistently used Capt. Kroon. This Register clearly spelled Ruben Strides, whereas that newspaper consistently used Capt. Stride. William Dickahoff becomes Capt. Dickerhoof and Andrew Caufman becomes Capt. Coffman. Names ending with Reid could become Reed, or Read. The researcher is encouraged to try variations in spelling to gain the maximum benefit. A few sample alternate spellings are provided in brackets.